The center of timing (CT) for streamflow, is defined as the day of the year when 50% of the water has left a basin for a given year. Across Idaho, the CT advanced from 1950 to 2005. The total annual volume of streamflow also decreased during the 1950–2005 period, similar to what others have found (1,2). For the shorter time period of analysis from 1975 to 2005, the CT of streamflow was 1.9 days earlier per decade (p 5 0.14, Table 1). 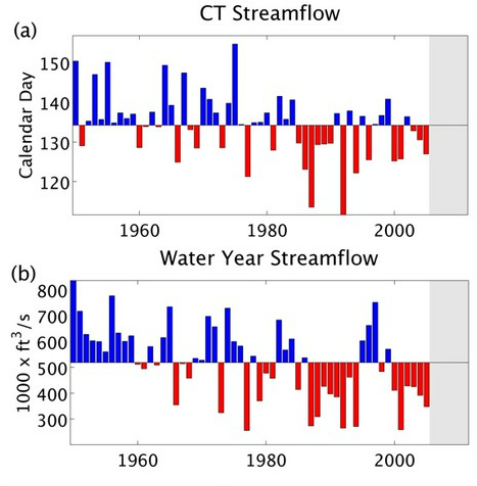 No trend was observed for changes in the annual volume streamflow from 1975 to 2005. Since variations in streamflow volumes between years are closely linked to large annual precipitation across the region (3), trends associated with temperature changes are difficult to detect within this 35-yr analysis period. Furthermore sub-basins span a range of elevations, therefore the influence of the transition from snow to rain over time has a complicating effect that is difficult to detect in this statewide-integrated analysis. Luce, C. H., and Z. A. Holden (2009), Declining annual streamflow distributions in the Pacific Northwest United States, 1948–2006, Geophys. Res. Lett., 36, L16401, doi:10.1029/2009GL039407. Hydrologic indicators: (a) mean day of calendar year for center of timing of streamflow across 26 stations in Idaho, (b) mean water-year volumetric flow in a thousand cubic feet per second across the same 26 stations. The horizontal line is the 1971–2000 mean for each dataset.